While encaustigraphics have great standalone strength, they can easily be joined by sewing, either with a machine or by hand. This garland is about three feet long (each leaf shape is about 3″ x .5″) and shows a great way to use your scraps to make something fun. It’s always problematic to use real feathers in art— The Migratory Bird Act forbids the collection or use of feathers, eggs, or nests of any migratory species. While many artists, including myself, are delighted by the find of a stray feather, its use isn’t an option. 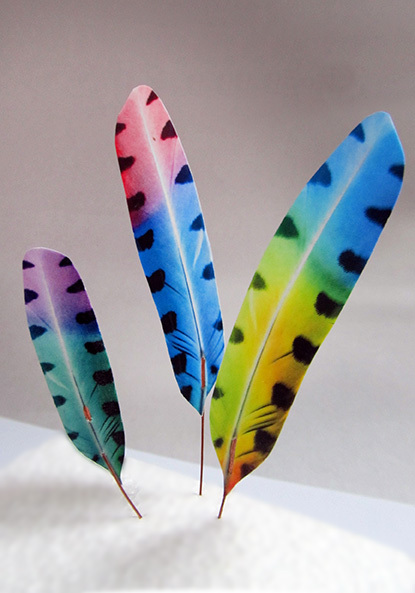 That’s why I was excited to realize that with e*graphics, I can make any kind of feather I desire, in any colorway or in any size! I’ve made them miniature for jewelry, and large for sculpture. 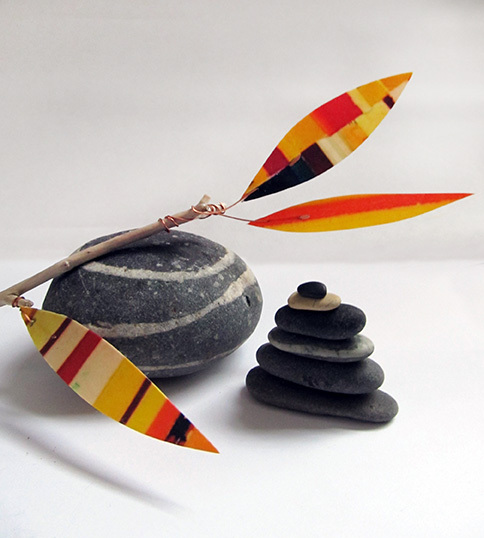 More photos of e*graphic feathers and their uses are sure to be on the horizon! I love making these fantasy leaf forms and attaching them to driftwood branches I find on the shore of Lake Michigan. The colors glow, and they will last, if not forever, certainly longer than true leaves! They bring together beauty and playfulness in a way I always hope for.